Consulting the accounting department for the slip of paper containing information about Employees Provident Fund is the past thing. By now most of the EPF users or subscribers must have been provided with the UAN or Universal Account Number. Last year the Minister of Labour & Employment asked the organizations across the country to provide the UAN number to Employees under the PF Act. Universal Account Number will be different and individual to each of the EPF contributing member and act as the Login information to check PF status and other information about your Provident Fund. The number available as Universal Account Number will remain for your usage even when you change the job, it will be available as service till you use and subscribe it. In the article, we will discuss the simple process that will help you to check the EPF Balance and the Status of Payment received from the company by using UAN number. You need to visit the new official EPF unified portal https://unifiedportal-mem.epfindia.gov.in/memberinterface/ in order to set in for the further steps in order to know the details about your account tagged with the Universal Account Number and EPF account. Step1: Once visited the site, you will see the login instruction on the right side of the page. For the first time users, you need to select the 'Activate UAN', once clicking you will be redirected to the main page for further information. Enter Member ID: From the available list of Office and Staff, choose your designation in the company and the name of office correctly. The next step in the process is to enter the company code offered by the employer; the code of each company provided by EPF Office differs from company to company. Step 2: Here We are using first option, as part of the process you need to fill the Universal Account Number (UAN) in the selected filed. Step 3: After entering the Unique number received from the authority, you need to enter the name, date of birth and mobile number submitted at the time of providing different information in the company. Step 6: After entering all this information, you need to enter the captcha code available in order to confirm you are not robot or machine. Just enter the code without any space and enter it following the correct uppercase and lowercase format, then click on 'get authorization Pin' button. 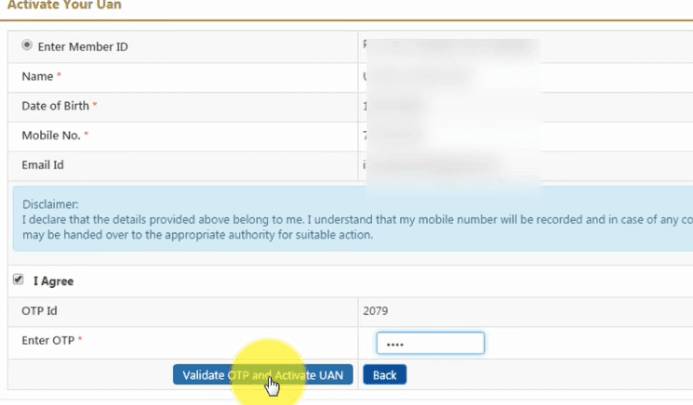 Step 7: For the confirmation, you are using the information that is confidential, there will be a 4 or 6 digit otp received on your registered mobile and click on 'valid otp and activate uan' Activating UAN will let you login in your EPF Account. The main page of the account will be available for you to use, you are advisable to change the password that suits you, for login UAN will be username and password you enter as NEW will be the password. In your account, you can download UAN card, update the information in the PF passbook and also it lets you check epf balance online. How to registration from new epf account... help needed ?